Did you ever wonder what makes Michael Moore tick? 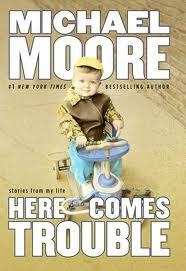 I loved Michael Moore's autobiographical book, Here Comes Trouble: Stories From My Life. In this book Michael tells over 20 stories of his growing up and current life from a personal perspective of his thoughts, feelings, and behavior as he grew up, became an adult, and a major, Academy Award documentary film maker. Michael, while Roman Catholic, espouses and lives the values of Unitarian Universalism. It is edifying and inspiring to read how he struggles with his values to become the adult man he is today. Michael is one of the those authentic souls among us who walk the talk, is the real deal, and is a modern day saint warts and all. Michael's writing is straight forward, incisive, and funny. He has just the right touch of humility and self denigrating humor to make this book a delightful read. "I had an unusually large-sized head, though this was not uncommon for a baby in the Midwest. The craniums in our part of the country were designed to leave a little extra room for the brain to grow in case one day we found ourselves exposed to something we didn't understand, like a foreign language, or a salad." You can support UU A Way Of Life by buying a copy from Amazon by using the UUAWOL book carousel in the right hand column. This is article #1 in a series on Book of the Week. Look for an article in this series every Tuesday. I enjoyed Michael's book a great deal too. It is worth the read. There are so many good stories in the book but one of my favorites is when the Sister shut down Michael's newspaper in fifth grade. It seems that Michael's honesty and integrity have been threatening the power structure his whole life.